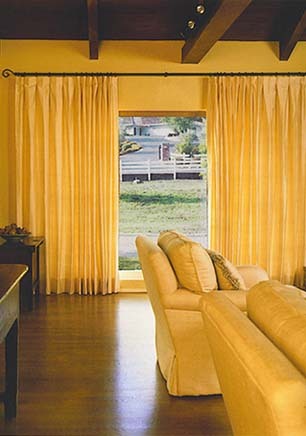 Custom curtains, Roman shades, drapes, blinds & window treatments in San Francisco, Santa Clara, San Mateo, Alameda, Contra Costa, and Marin Counties. In-Home Design Service. Free Estimates. Drape Designers have been working in the Bay Area since 1994 and have serviced over 5000 Residential & Commercial clients. Thousands of fabrics from which to choose, including Green/Eco-friendly varieties. Great selections of hardware and design options. We use the highest quality, local workrooms. Our professional installers are bonded and insured. You can go to an Interior Designer and pay an hourly fee, consultation fees plus up-charges on all fabric and labor. You can go to a drapery store and pay the owner’s rent plus the salesperson’s commission. Or you can buy from Drape Designers and receive the same expertise at a much lower cost. We come to your home or business, for a free estimate (based on proximity), with a variety of fabrics & design options in all price ranges. We can design any type of window treatment for any type of window. Drapes- all styles of pleating and grommets. All styles of Roman shades and blinds including bottom up/top down, curved and arched. Any type of valance, very simple to extremely elaborate. There are many styles of decorative custom hardware to choose from: motorized, classic wood and handmade wrought iron rods that can be bent or curved for bay windows. We design and manufacture Custom Bedding, so that it will fit your bed and mattress to their exact specifications. We can reupholster furniture you already have to compliment your new décor. Sorry, we do not repair or alter any products not originally purchased from Drape Designers. Email us, call or text 650-703-3590 for more information.